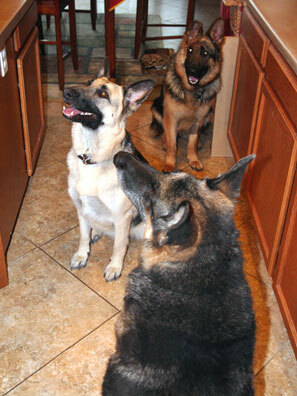 I hope you all enjoy reading the story of Rescued GSD Axel sent in by one of our readers, Susan O. Thanks so much for sharing this with us Susan. I hope your story spurs more people into action against animal abuse and encourages more people to give needy animals a safe home. I’m attaching a picture of our new boy, Axel. We rescued him from an abuser and he is adjusting to home life very well. He’s only 11 months old but has already had three facial reconstructive surgeries on his face, with one more planned where they will attempt a skin graft to give him an eyelid. I think he’s perfect, just the way he is. Axel is nearing graduation of advanced obedience training and when he gets a little older, we will train for the Canine Good Citizen test. After he graduates, he will partner up with our local Sheriff’s office and become a Animal Crime Dog and we are planning to visit the elementary schools to talk to young children about animal abuse. Axel loves people and he’s very smart – and that just ain’t me braggin! 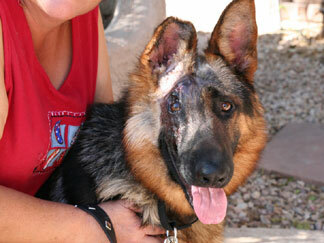 He deserved a second chance and he’s been a wonderful addition to our German Shepherd family! Thank you for considering Axel and we love your website. Susan, Thank you so much for sharing your great story about rescuing your wonderful new German Shepherd puppy Axel - what a sweetheart. And I'd like to take the time to say thanks to all our visitors for reading along with us. If you get the chance, please come back often to see what else is going on in our growing German Shepherd Dog community. So now it's all up to each of you. Share with us as you'd like, read the stories of others, watch a few German Shepherd videos and see what experiences others have had with their own GSDs. Thanks for visiting us here at Total German Shepherd.